Band conditions haven’t been so great either. Will, AA4NC woke up at 0915z today to work RTTY on 30m and got no takers, so he moved to CW. He did a pretty good run. Ray, W2RE did a couple of runs on 17m and 20m, but overall, the band conditions aren’t as good as they’ve been. We’re expecting things to open up around 7PM local (2200z) and will have all 4 stations going. We’re getting down to our last couple of operating days and want to get as many QSOs as possible. Pat made it back from the mainland this morning, just before a fog system moved over us, so we haven’t been able to get logs from Atlantic Cove. Hopefully we’ll find a window this evening, but if not, we’ll push new logs out tomorrow when the weather is supposed to be sunny, clear and calm. Stay tuned for more! vy 7e de VA3QR/CY9. Thanks for all of your efforts. Unfortunately the band condition is very poor between CY9 and Asia. I do hope you will beam to Asia on 30, 20 and 17m band and pick us up more. Thanks again Phill and enjoy the pile up. Italian Radio Amateurs are conducting emergency traffic on the Amateur Radio Bands. CY9C was operating RTTY at 7042 today, which is almost on top of the 7045 QRG with the 1-3 UP. Clublog shows real picture that you have too few Qs with our Zone (17). Specially looking for you on 30 & 40m CW. Have a fun and safe trip home! Thank you for getting on 160m later last night and at your sunrise. I missed your sunrise CQ by 45 minutes (zzzzz). 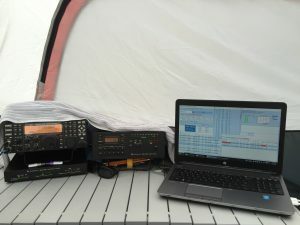 The evening activity was on SSB, which was impossible to copy through the T-storm QRN out here in the west. We will keep listening for CW tonight, just in case. Go get those ATNOs – they are more important.